Colonel D. O'Dubhshlaine reporting in as ordered to you lads and lasses alike. I feel as though it's been far too long since our last pint together, wouldn't you agree old boy? All right, all right, straight to business. 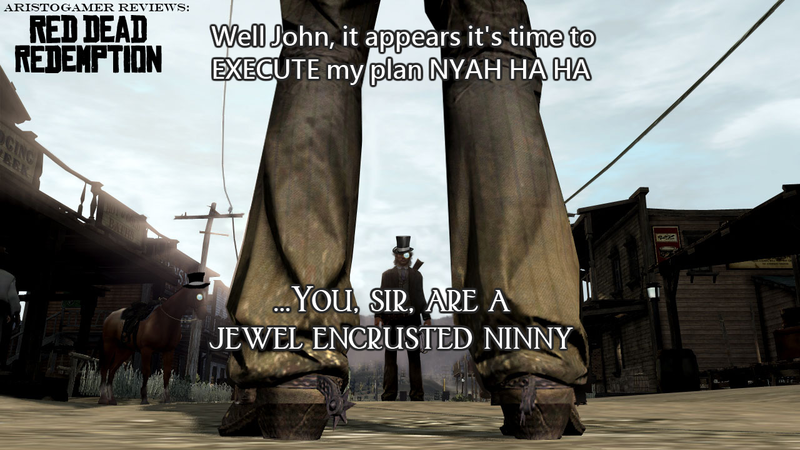 Red Dead Redemption. Many of you have played it, of this I'm certain. Myself, I've devoted much of my precious time to playing this game and I can ascertain one very simple conclusion: if this game could be a replacement leg for the one I lost in the old war, well, I would wear it proudly as if my own mother made it. I don't think it can get any clearer than that. Now for the simpletons in the audience, I'll reveal why this game is so bloody good without divulging too much of the plot; too much spoiling is like a bout of gout...at first it's not a catastrophe, but as more sets in, it gets to be a real bother of a problem 'ere wot. Now then, plot and characters. As far as storylines go, this particular one is almost worthy of Conan Doyle's signature, which, I'm certain my esteemed colleague Mr. Rommefeller can attest, is quite a compliment to bestow upon a story. If you're a veteran of previous games in this series, then you'll already know John Marston's back-story. However, therein lies one of the joys of this game; the player needn’t be a veteran to the previous titles to fully appreciate the characters, much like the tales of Sherlock Holmes. The moment John literally steps off the boat, you're drawn in to his story, and if you aren't then I can say with a full certainty you were probably born without a shred of a gentleman's soul in you, you dim-headed troll of a man. Throughout the entire game, the story involves unique and interesting characters that bestow all sorts of emotions, creating a very diverse environment. In fact, the style of this story is what makes me appreciate this game so bloody much. I had the honor to play this game on my Playstation 3 and I can say that although not entirely perfect (though what game's controls are, eh old boy? ), the control schematics of this particular game were definitely very good, and this can be proven by one simple fact; they did exactly what I ruddy well wanted them to! I could sit upon my leather lounging chair and play the game without needing to actually look at the controller or pause the game to look up how to do something. I acted, my character reacted, it was that simple. However, I do feel many people complain far too often about "bad controls". I will grant that while there are some games with impossible-to-respond controls, I feel more oft than not, people whinge about controls simply because they're codswallops who are still accustomed to a previous game's controls and don't want to put in the proper effort to learn. If my old Captain heard such complaining, it'd be 10 days in the heatbox for you! Ack, I'm getting off track. Right! Red Dead! I think gameplay itself is next and last, in which I'll try to incorporate the elements of playability, sound, and diversity of style. The gameplay itself is as addicting as a good gin and tonic. I'll admit, as a young lad I would dream of being an old west cowboy yankee doodle who would ride into the sunset shooting blazes of gunfire into the air (although without the whole "suppression of a native people and driving them off land in name of manifest destiny" bit). This game properly allows anyone with such a childhood fantasy to live it out, which is probably why it's so bloody good. You can complete a main storyline that is beyond enthralling, or you can waste some good time riding your steed from town to town completing side quests, saving damsels, or even just play a good gentleman's game of poker. The music can be summed in this one sentence...it sets the mood as much as a Wagner's Ride of the Valkyries sets the mood for any pilot going into combat. Although the music is very western-themed, which is just fine, it's the style of each area of this massive map that truly impresses me. You not only have your wild west towns to enjoy, but you have the American desert, the Mexican border, and the Northern forested territories that would you expect in any Yankee western movie. In fact, this map alone just shows the diverse nature this game includes. It's probably this diversity along a central theme that leaves the replay value of the game very high in my book. Any chance I feel the need to relive a childhood dream, it's easy to do without worry of boredom setting in. If I feel the need to collect bounties on hooligans around the town of Armadillo or hunt dangerous prey in the northern woods (as I tend to do in my spare time around home 'ere wot), it's all available! Now, I'd go into more detail for the areas, but really what's the bloody point? They're apart of the map, they're incredible, and all that's left is for you to enjoy them yourself to see what I mean. I'm done with this bloody review, you've got all you need to know, now get off your arse and get to this game! If you have already, well, then good for you lad/lassie, I'm glad to see some of you still have good enough sense to recognize an incredible game when you see one. One of the most ambitious undertakings in the realm of video games as of late, Heavy Rain promised a mature story, driven by well-developed characters; a game in which attempting to quantify the number of possible endings would be entirely futile.. Each choice in Heavy Rain has its own repercussions and its own influence over the ending, sometimes in astounding, baffling ways. I myself found only one of the many endings, but the real question is whether or not this game found its way into my heart, nestled firmly between my Model T and a stout brandy. 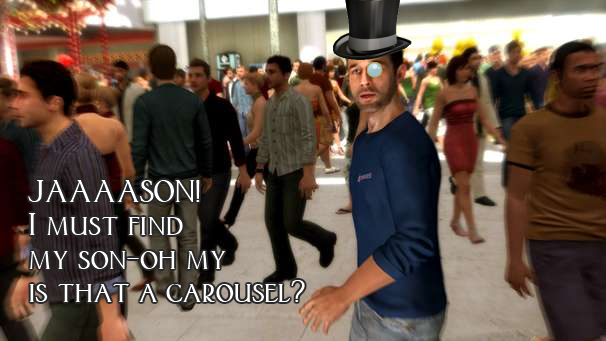 The creators of Heavy Rain certainly took video games to a very non-traditional place. The game strove to create tense moments in which the player knows that for any mistake, it would be the characters paying for his inadequacy, sometimes with their lives. A driving novelty behind this game is that the main characters can not only fail their objectives, but be can also be completely removed from the story with the ending of their lives. Heavy Rain adds a refreshing element of urgency and permanence to the gameplay in that the player’s failure can result in the death of a character, but without the option to “respawn” or start anew. I found this particular feature to be not only entertaining, but also somewhat rewarding for me in that I felt quite good about myself when I was able to successfully maneuver the characters out of a bind. Allowing for the possibility of such radical changes to the story based entirely on the players choices and skill also allows for overwhelming replay value. The story of Heavy Rain is deeply seeded in Hollywood thrillers. From the charming, gruff private eye to the uptight FBI agent, the usual cadre of characters is all in place. Normally, I would find this feature bothersome as I bore easily of typical stories, but the developers were able to avoid such pitfalls by use of clever changes in the pacing and perspective. I wasn’t aware until much later, but the story was such that I could have simply been viewing a 20-hour picture at a nickelodeon. My sincere praises to the staff for turning what could have been a frustrating game into one that was not only fun, but fascinating as well. Though the story is engaging, I was taken out of the moment more than a few times by the dreadful voice acting. My initial discomfiture arose during a mall scene in the beginning of the game. There was something quite off about the way the father shouted for his lost son “Jason!”; it was a decidedly cringeworthy performance. I have partaken in a few of the animated cartoons from the East in my time and am somewhat of an expert in bad voice acting and unfortunately, Heavy Rain’s cast qualifies as such. In addition to the father, all of the children sounded entirely disinterested, the FBI agent had an troublesome lisp that made his vocal emotions difficult to discern, and the “lady of the evening’s” voice actress sounded as if she had some sort of brass bit permanently wedged in her mouth. I believe a few additional weeks of voice casting could have done this game wonders. Perhaps the FBI agent should have been played by a more aristocratic gentleman? I can think of no way the controls for the game could have been improved, but I oft found myself quite frustrated with them. As the player watches during tense moments, buttons or movements flash on the screen. If one is not as adept with his DualShock 3 as he should be, he may very well find himself on the wrong side of a gun. Small failures in dexterity can have catastrophic results in the game and, because of the autosaving mechanism, you cannot simply quit and retry. Even if you could, you may not even be sure that your intended path was the “correct” one. 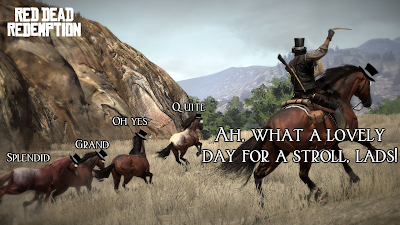 The uncertainty in one’s choices and hurried button pressing certainly add tension to the gameplay, but they also add very real frustration, sucking me out of the dreary world and back to my cozy study and admittedly impressive menagerie of muskets. Heavy Rain is a game that stands on its own as a wonderful experience and one that can easily be played again and again. The subpar voice acting could have been improved by more diligent casting, a relatively paltry and simple fix. I am wholly disappointed that the game is not as engrossing as it could have been, due not to a deficiency on behalf of the story, but because of the auditory characteristics of the people telling it. The controls are unfortunate for a perfectionist, but I believe they could not be improved in any way. This game is highly recommended for players as well as people who simply enjoy watching the gameplay. Not only did I thoroughly delight in playing this game, I look forward to repeating the experience with a slight variation in my chosen actions. Death is a ghoulish eventuality, particularly so in Capcom’s latest pursuit, the aptly named Ghost Trick. 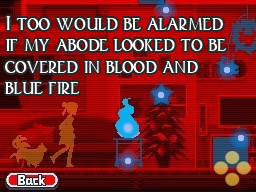 The game features the crimson-clad Sissel, a mysterious man on a quest to find the ruthless miscreants who have done him in, as well as to assist in preventing the untimely deaths of the do-gooders he encounters during his ghostly exploits. I must admit, my initial interest in this title was rooted largely in that the creator, Takumi Shuu, also created possibly my favorite game series, Ace Attorney. The question remains; does this game live up to the lofty standards that Ace Attorney fans have come to expect of Capcom? Or was I left to fill my whiskers with sighs of disappointment? 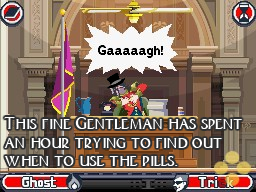 The storytelling in Ghost Trick is quite fluid. The game’s clearly defined segments consistently culminate in the revelation of small piece of the overall story. I rather enjoyed the leisurely pace at which the saga unwound; it added a delightful sense of tension to the gameplay. Many game writers attempt this thematic device only to have it result in much vexation on behalf of the player. Fortunately, Ghost Trick’s narrative is small enough in scope and robust enough in content to keep one’s interest effectively. This quality is largely the doings of well written, enjoyable characters like Sissel and perhaps the most saccharine character I've ever had the pleasure of coming into contact with: Missle. For the most part, I found the gameplay to be both original and interesting. Sissel’s specter can maneuver about between inanimate objects when in “ghost mode” and can “trick” objects, making them perform a specific action. Determining the proper objects to use in each situation is challenging, as some objects do nothing at all and others are intended for use in later puzzles. The ability to reuse objects and environments render each task all the more difficult, as solutions the player has previously devised may not necessarily apply in the next puzzle. The score is not particularly notable. The music seemed to all but vanish as I focused on the tasks at hand. At times my assiduous mind would briefly stray and I would enjoy a note or two, but I would soon find myself back in a state of focus from which no earthly delights of the ears could tempt me. It is certainly not a soundtrack I would purchase for my Victrola talking machine, but it does a good job of maintaining the unearthly ambiance without becoming intrusive. While the gameplay is engaging, it does get monotonous. The moving objects also present a gameplay paradigm that most players are not accustomed to in puzzle games—timing. Oft I knew well what needed to be done, but my timing was ham-handed and I had no choice but to restart the level. At times I was forced to restart a puzzle so often that the game became less of a good-natured challenge and more of a querulous botheration. My frustration stemmed from instances in which I detected what was to be done only after it was too late and a particular object could no longer be used. Once the window of opportunity had passed, the player’s only recourse was to begin the level anew and hope to be less clumsy this time around. Occasionally I would find that I had prematurely used an item, only to later learn that its place in the grand ghostly scheme of things was mere moments after my original placing. The frequency with which events like these occurred likened my anger to that of a frog in a sock. The very nature of this game necessitates that only one correct answer exist, and even if the player is convinced of the validity of their solution, it simply will not work unless it coincides with the pre-programmed path. These baleful errors in the gameplay were such that even at the conclusion of the trials, the story was just not as rewarding as it should have been. A minute or two of advanced story after such tiresome and exacting efforts left me at times feeling positively swindled. Luckily for this old chap the game is on a portable console, thus allowing me to walk away for a bit, perhaps play a rousing game of snooker with the Baron, and return with ease. Simply put, the game’s linear gameplay and frustrating moments detracted from its innovation and enjoyability. I personally am accustomed to such small impediments, being a devotee of the Ace Attorney series, and thus was expecting to be somewhat frustrated before I commenced this gaming journey. 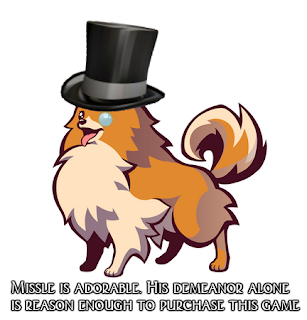 I am confident that my fellow fans of the Ace Attorney series will revel in the story and tolerate the sometimes befuddling gameplay. I fear, however, that some gamers will be unwilling to weather the storm of chagrin in order to unravel the mysteries of this intriguing game. Ultimately I would recommend Ghost Trick to everyone, but not without forewarning them as to the nature of the gameplay. Good evening, ladies and gents, J. Wellington Rommefeller here. I’ve recently completed EA’s latest venture into the survival horror realm—Dead Space 2. I must say, it was a bully good time, but not one without its mishaps! Dead Space 2 is the sequel to Dead Space, a 2008 release which chronicles the tale of Isaac Clarke, an engineer charged with the heady task of saving his own life and that of his fair lady friend. I shant delve too far into the original, but suffice to say, things quickly devolve into quite the hullabaloo. In the sequel, Mr. Clarke finds himself in a sanitorium of some sort and it appears the necromorph infestation has broken out yet again! Oh my! 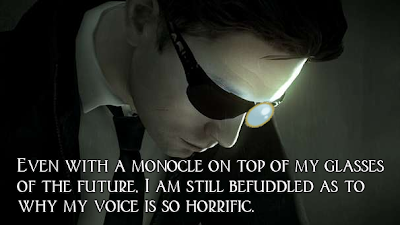 True to form, Mr. Clarke takes it upon himself to destroy the necromorphic fountainhead in order to prevent a recurrence of the unfortunate events aboard the Ishimura. When Dead Space catapulted onto the scene two years ago, I recall playing it and musing to myself “J. old boy, at long last a survival horror game of your fancy!” The original was quite suspenseful, had an engaging storyline and could go toe-to-toe with established series like its sanguinary forebearer Resident Evil. 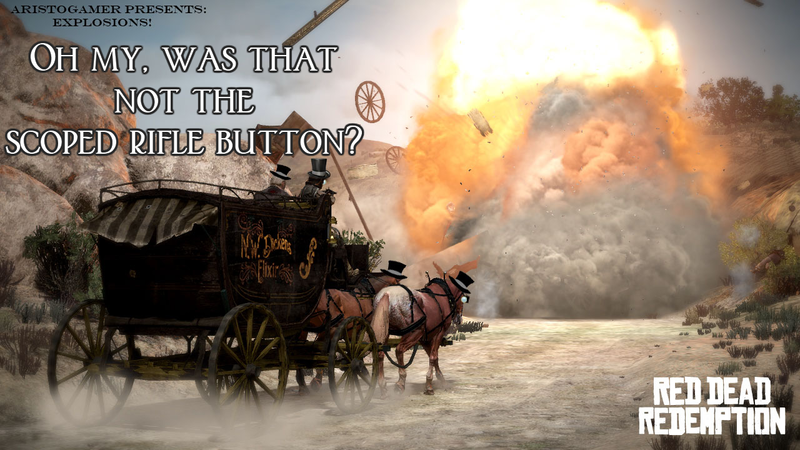 And by Roosevelt’s riding crop, Dead Space’s successor does not disappoint! My only grievance against the original game was the confounded zero-G controls, and they’ve been wonderfully improved! 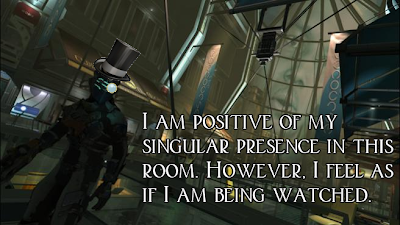 Instead of Mr. Clarke’s movement being restricted to bouncing about from surface to surface, our intrepid engineer may now float about as he sees fit. Dead Space 2 delivers superior controls and map functions as well, now employing a phosphorescent pathway to guide you to your objective, or the nearest store, bench, or save station. 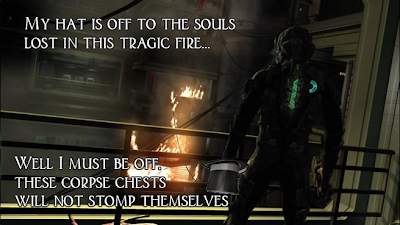 Dead Space 2 also intensifies the degree of virtual carnage in new and unsettling ways. I must confess I did away with poor Isaac more than a few times simply to witness the interesting ways in which he snuffed it. I would not normally find amusement in such frippery, But the myriad of ways in which the hapless Isaac was catawamptiously chewed up was far too entertaining to pass upon. 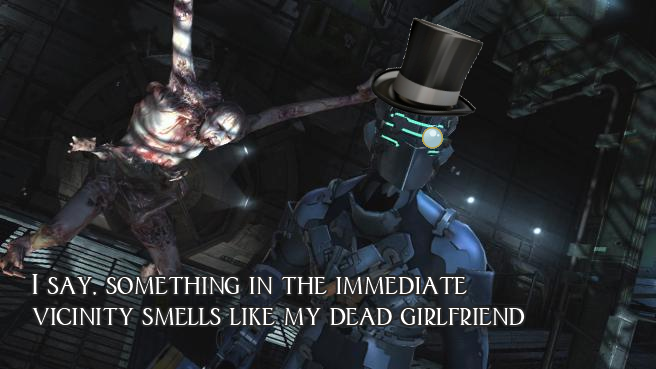 Dead Space 2 became no less thrilling as I played. In the time since the original’s release, I had forgotten just how skilled the blokes at Visceral Games are at building a suspenseful moment! I often found my moustache hairs standing on end as I fearfully anticipated the appearance of yet another hook-taloned ghoul. Minutes of empty corridors and vacant air ducts withdrew me from the edge of my seat, but only long enough to properly shock me with a deluge of new horrors for Mr. Clarke.. The developers have quite a knack for playing on one’s fear of the unknown. Isaac Clarke acquires a new female companion this time around; Ms. Ellie Langford is a stalwart and tenacious female lead who compliments Isaac’s characterization in Dead Space 2. The risk involved in this endeavor was considerable given the previous game’s heavy focus on the ill-fated bond between Mr. Clarke and Nicole Brennan, Isaac’s sweetheart. Fortunately, Ms. Lankford is an alluring character who Serves to help Isaac on his quest as well as to provide him with motivation in times most grim. 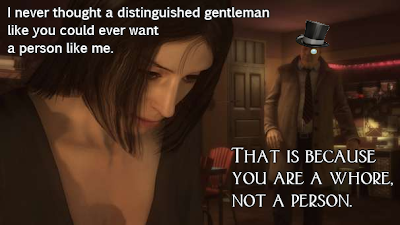 The presence of a consistent, capable female character throughout the game is a wonderful juxtaposition against Ms. Brennan as the first game was spent largely in pursuit of Mr. Clark’s lover and the tedious, cryptic messages she left behind. Dead Space 2 took quite a substantial risk by instilling its previously reticent protagonist with a voice and personality; until now, these aspects of Isaac were left up to the imagination of the player. I must be frank, Mr. Clarke’s characterization feels truly botched up. It goes without saying that not everyone’s perception of who Isaac was in the first game could be realized, but I personally found virtue in the stoic strength of Isaac as the silent hero. I oft thought of him as a quiet man, an engineer who sought nothing more than to do his job and save his ill-fated lover. 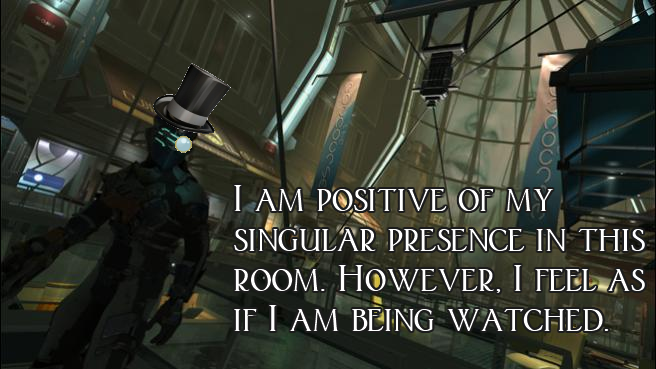 My dissatisfaction with Dead Space 2 stems not from the idea that Isaac isn’t the fellow I thought he was, but rather that he is who most other survival horror characters are—a droll but affable man who wisecracks his way through mission after mission while simultaneously carrying a dark past. I’ve seen this character depicted again and again throughout my gaming pursuits and I grow ever so weary of it. Had I inclination to cavort about shooting large weapons and solving puzzles as a cheeky hero with a heart of gold I would simply play Uncharted –Nathan Drake has far better quips. Visceral Games crossed the Rubicon with this error, and I see my list of strong, silent, respectable main characters shrink yet again. 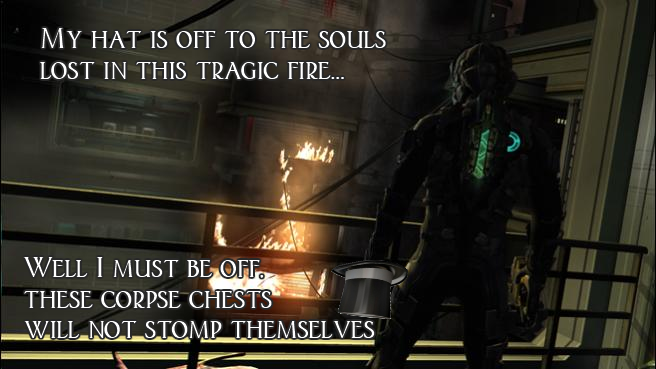 Dead Space 2 is a stupendous follow up to one of the survival horror games closest to my heart. Isaac Clarke may not have been the man I envisioned him to be, but the engaging gameplay and suspenseful storytelling kept me enthralled down to the short strokes.